This book was so good…so amazingly heartstoppingly delicious. I think I just read that there is a movie deal on this. If this is true…it will be amazing. I think I am taking a vacay away from vampires, werewolves, witches and daemons but oh my goodness am I ever loving these awesome dystopian thrillers. Imagine varying factions in society…Abnegation ( selfless…sort of reminded my of the Amish ), Candor…truthful, Dauntless…brave, Amity…peace keepers, and Erudite…really smart. These factions all exist in Chicago…but a Chicago that is devastated. Also there are people who don’t fit in these factions. I think they are the factionless and no one wants to be one of these. Anyway…when you are 16 you have a choosing ceremony. You have been given aptitude tests to help you decide where you think you belong. 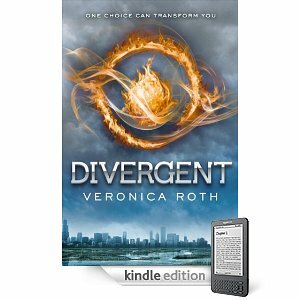 Beatrice Prior has lived her first sixteen years in Abnegation. Her choosing ceremony surprises everyone. And this is where the real fun begins. That and the fact that she might also be Divergent. Again…totally loved this book…could not put it down. Excitement and thrills and of course a bit of a romance…a sweet sort of first love. But for Beatrice everything is a first.